You probably never met my friend Des. I’m sorry for you. But I don’t want you to miss out on what I learned from his life, so I’d like to introduce you to him through the stories I’ve cobbled together. I’ve spent around 6 months in Brisbane, Australia over 4 trips since 2004. Each trip has been different in the adventures and experiences. Each trip has remained consistent in the people I’ve shared the adventures with. Des and his wife Lena were and are 2 of the people who were always part of what made my time in Australia joyous. And they were and are part of the group of people who have become my family. 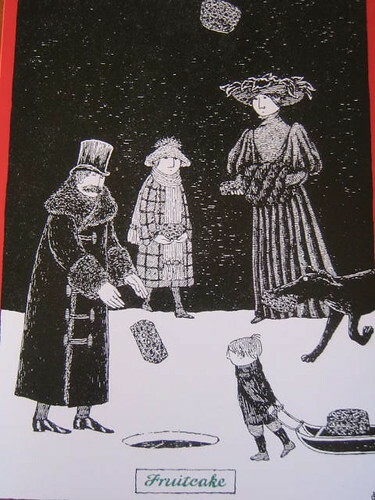 One year, I mailed them an Edward Gorey Christmas card that showed an assorted collection of creatures throwing fruitcakes into an ice hole. The next time I saw Des, his first word to me were “What’s with the fruitcake?” It had been a year since I’d seen him. That was the only greeting I got from Des for most of that trip. I hadn’t realized that fruitcake is actually eaten in Australia. I will never forget that now. I saw Des last summer. The schedule was crazy, so there were fewer moments to share. My favorite is rather longer. 20 or so of us, U.S. and Aussies, traveled 6 hours north and west from Brisbane to the tiny town of Eidsvold on the edge of the outback. We were doing some work around the Christian Centre which the community uses for day care and events that need space. Des was leading the 20something U.S. boys in the cleaning up of junk that had to be taken to the dump, but they were working through lunch. And since we were all there together it meant that we were all waiting until they were done to start eating. People were starting to get restless, and I figured they didn’t know we were breaking for lunch, because when to 20something guys ever listen to group announcements? So I wander over to the very short fence that marked a border on the property, and I told Des that it was lunch time. Des’ deadpan response was, “Well, you may be here to fill your belly but some of us came here to do the Lord’s work.” To which I calmly responded, “Shut your face and get over to the lunch table. You’re holding up the food for the rest of us.” And then I walked back to where everyone else was, with Des and the boys not too far behind. Later that evening there were pockets of conversation, and Des and I happened to be in one of those pockets. I’d been thinking about our exchange earlier and I told him that I thought people who didn’t know is might think that we didn’t get along. And he seemed surprised by that. I think these stories are so clear in my head because they explain so much of who Des was. He was straightforward and dedicated and funny. And he wasn’t too concerned with the way other people saw him. He was himself and never apologized for that, but he didn’t try to drive other people away either. He accepted people without hesitation but was never afraid to call people on the crap they were pulling. He was a very dear friend whom I admired greatly. 33 is far too young to have your heart attack you, and I am having a hard time believing that he is dead. I wish I had told him more of this the last time I saw him. But I hope for so much more. I hope the stories of his life encourage people in his stead. I hope that Des’ example of a fearless life inspires those who know it to walk a similar road. I hope that sad regret does not cloud the memory of his life lived well. I’m really sorry your buddy died. He sounded really cool.